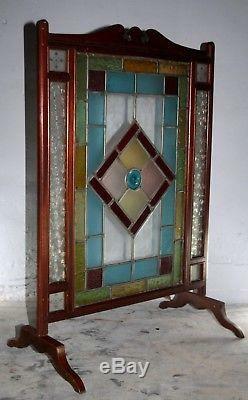 This is a particularly attractive stain glass fire screen. 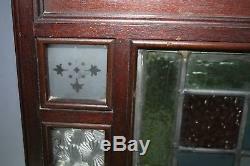 It is late Victorian Arts and Crafts dating to around 1880 - 1900. 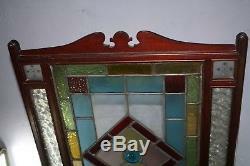 The screen has a shaped mahogany frame. 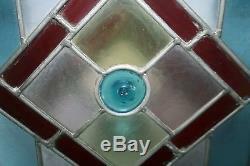 The leaded glass has a bullseye centre with different colour and textured glass panes. The glass is in generally good condition. 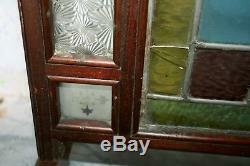 Three cracks to small panes - see photo. The feet swing about on screws so the screen can be stored flat against a wall. I will take the feet off for posting so you will need to screw them back in place. The soft blues, greens and yellows are very attractive in this screen. It will look good in the fireplace of a house furnished in Arts and Crafts, Antiques or a more contemporary eclectic vintage setting. The screen is 32 inches high and 22 inches wide. 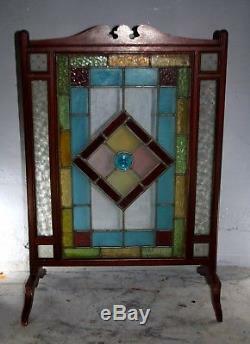 The item "Victorian Arts and Crafts stained glass fire screen stand 1900" is in sale since Sunday, March 11, 2018. This item is in the category "Antiques\Antique Furniture\Stands". 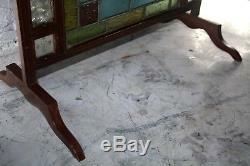 The seller is "warwick141" and is located in Mold. This item can be shipped to United Kingdom.